In 1940, more than 300,000 Allied soldiers were trapped and surrounded by German forces in Dunkirk, France. It was a devastating blow and a key victory in the Battle of France; Hitler would not be stopped for five more years. However, the evacuation and rescue of the troops by British destroyers and other smaller vessels, including fishing and merchant boats, was nothing short of remarkable. In the end, Winston Churchill proclaimed it a miracle in the midst of sheer military disaster. English writer/director Christopher Nolan brings us his vision of the event in Dunkirk, concentrating on three separate storylines. In “The Mole,” we follow Tommy (Fionn Whitehead), a young, terrified British Army private trying to escape what seems like certain death: Fly-by bombs explode all around him, bullets narrowly escape him, and drowning is just one breath away. In “The Sea,” a sailor by the name of Dawson (Mark Rylance), his son (Tom Glynn-Carney), and his teenage friend (Barry Keoghan) attempt to reach the beach in order to save whoever they can. And in “The Air,” Spitfire pilot Farrier (Tom Hardy) and two other airmen scramble to protect the rescue vessels from enemy planes. All of this is orchestrated, as we’ve come to expect from Nolan, in a highly authentic fashion: Dunkirk was filmed on large format 65mm by ace cinematographer Hoyte Van Hoytema, and it looks incredible. Even more impressive, there’s virtually no CGI, instead opting for practical effects that include real images of battleships going under and planes crashing; an image of men trying to escape from an ocean engulfed by oil and fire feels as claustrophobic and horrific as it sounds. Also on display is Nolan’s fascination with time, each story living in different chronologies — a week, a day, an hour — that eventually come together and overlap. Technically speaking, Dunkirk is as impressive as they come. But impeccable skill does not a great movie make, and just like in some of his previous work, something is missing. Both Inception (2010) and Interstellar (2014) suffered from dialogue that over-explained the plot without seeming to come from real people. Dunkirk goes the opposite way: There isn’t enough dialogue, and with so many characters to keep track of, it’s difficult to build sympathy with any of the soldiers or civilians fighting to survive. Nolan focuses instead on the more visceral aspects of the plot, be it a cockpit slowly filling with water or a torpedo approaching at full speed. Sure, it’s exciting, but what’s the point? 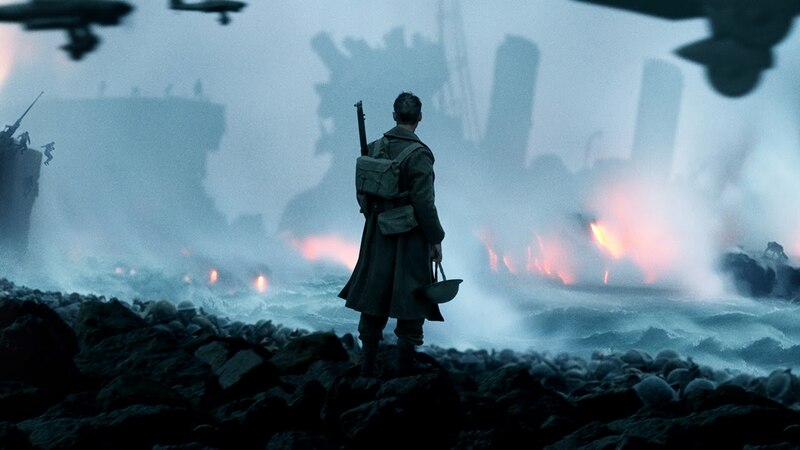 Moreover, Nolan lets composer Hans Zimmer take full reign over the mood of Dunkirk, with a frenzied score of drones and synthesizer effects that never lets up. And I mean NEVER — it’s two hours of incessant sonic bombardment meant to evoke the cacophony of war, but instead coming off as overkill. It’s a big mistake. I can just imagine how much more impactful it would’ve been to have no score at all. You could argue that Stanley Kubrick — one of Nolan’s main influences — had a similar clinical approach to craft over feeling, which still resulted in films widely regarded as the finest in cinema . . . and you’d be right. But Kubrick still approached emotional engagement through characterization and dark humor: Colonel Dax’s idealism in Paths of Glory (1957); Alex’s degrading behavior in A Clockwork Orange (1971); Jack’s derangement in The Shining (1980); Pyle trying, and failing, to survive Hartman’s abuse in Full Metal Jacket (1987). He understood that drama came from the exploration of human desires and imperfections, and his filmography is rightfully ingrained in the memories of cinephiles all over the world. Don’t get me wrong, it’s not as if Nolan hasn’t done it himself before: Both Memento (2000) and his remake of Insomnia (2002) featured complex, fleshed-out characters. But it seems like in the last few years, big concepts and spectacle have taken a more prominent role in his often mathematical approach to directing. Dunkirk may be an extraordinary technical achievement, full of jaw-dropping moments. Yet as I walked out of the theater, I immediately forgot it. It needs a soul.